A pleasant and delicious afternoon, spent with people passionate about wine and food has turned me into more of a wine enthusiast then I already was. 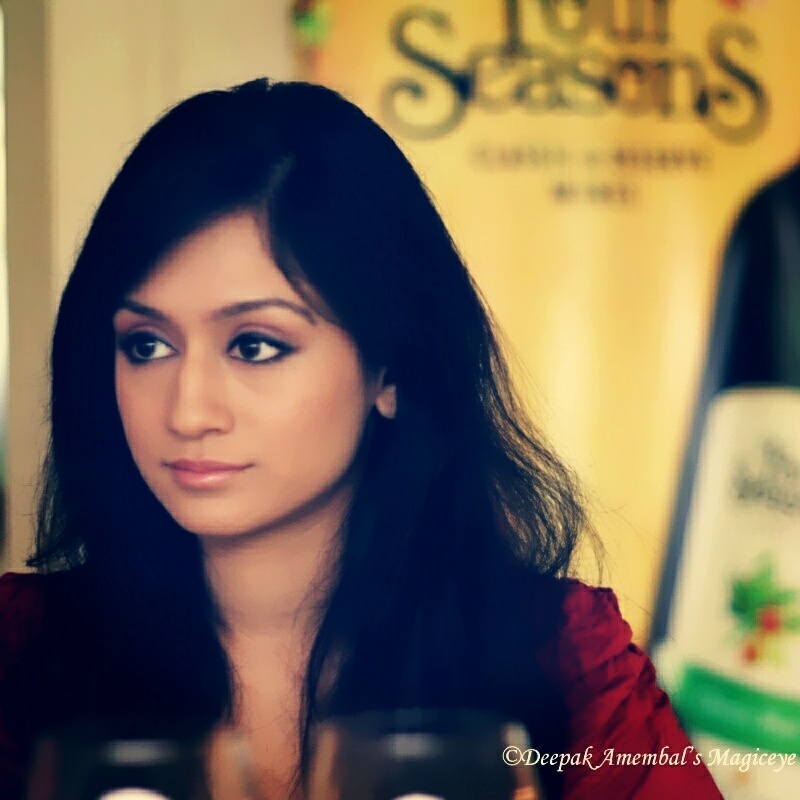 The wine tasting held by Four Seasons was hosted by the lovely Shamita Singha, Femina Miss India Earth 2001 and the brand ambassador for Four Seasons Wine. The Four Seasons winery, situated in Baramati (an hour and a half’s drive from Pune),will be open to tourists from this year, and seems like a perfect, exotic getaway. From the site : The lush undulating hills of the Western Ghats offer not just a breathtaking landscape but are also endowed with perfect natural conditions to nurture fine varieties of wine grapes. These hills are blessed with gravely soils that are rich in iron and have good drainage. Not so warm sunny days and cool nights ensure a good temperature variance – a must for quality wine making grapes. Set amidst this environment, near the village of Rotti, in the Baramati district, is the Four Seasons Winery, where this exquisite range of Four Seasons Wines is produced. 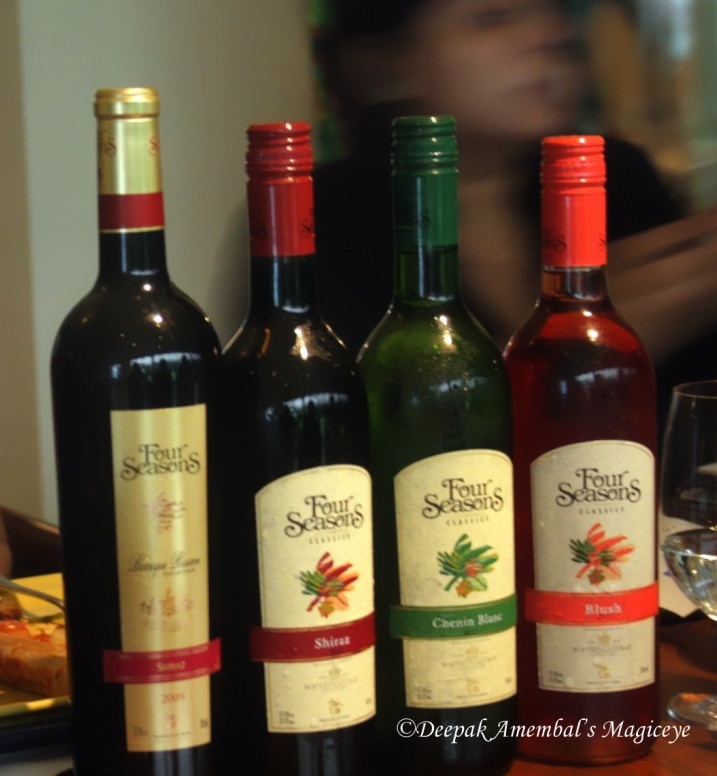 Shamita guided us through the wine tasting process by following the 4 S’s. “The first step is to just to see your wine. Wine is about bringing all your senses together. The colour of the wine can also tell you a lot about it, in white wine if you see a really pale coloured liquid, you know it’s a young wine. Young white wines are pale coloured and get darker with age. With red wines it’s exactly the opposite. Young red wines are very deep, dark coloured and as they grow and mature they get lighter. The next step is to swirl your wine. A good way to do so, is to put your glass down on a table, get some support and swirl it, that way you won’t spill it. Give it a nice swirl so that the wine opens up. The third step is to just smell it. Stick your nose deep into your glass and take a nice big whiff. What you want to smell is something that is appetising, to know if the wine is fresh or not, because sometimes wines can get infected. You want to smell fruit, something that is appetising, something that you want to taste. The fourth and the final step is to sip your wine. Take a nice big sip, swirl it in your mouth so that your pallets can absorb full flavours of the wine. Try and assess the flavours and then swallow it.” says Shamita. Aloo Panch-Foran (Sigdi BBQ'd Baby Potatoes marinated in Mango Pickle) and Murgh Nawabi Tikka (Tandoor roasted, yoghurt marinated Chicken) was served with The Four Seasons Chenin Blanc. Bhoona Paneer Kathi Roll and Tulsi Patte Ka Jhinga (Tandoor cooked, Holy Basil flavoured Prawns) was served with Four Seasons Blush. The off dry, fruity blush was my favourite wine of the day. Peshawari Paneer Tikka (Crushed Spices rubbed Paneer, Tandoor cooked) and Bhoona Gosht Kathi Roll was served with Four Seasons Shiraz. Kesari Khumb Tikka (Saffron marinated Tandoori Mushrooms) and Lucknow Seekh Kabab (Sigdi cooked, coarsely ground Mutton Seekh) was served with the complex and earthy flavoured, 2009 Four Seasons Special Barrique Reserve Shiraz. There is no fixed format of wine and food pairing, as long as you are enjoying your food and you are enjoying your wine side by side. There are a few thumb rules that can be followed, but no right or wrong as such. The most basic rule being, that the flavours of the wine and the food paired with it should not dominate each other. Got to meet these amazing people at the event. Do check out their blogs. What a wonderful event to be invited to! I've always been a big fan of wine. That's some really handy info you gave! :D :D The four S's! Nice! Thanks for tips. Mouth watering menu. Thanks again for links. I will surely visit them soon. Been so caught up at work, hardly get time these days. Ditto. Have been so busy with work.